Since I have a few moments between tasks and the bands are effectively dead with this no-antenna antenna of mine I figured a brief note about the following item is called for. 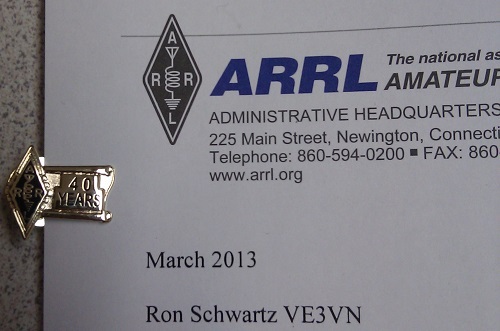 A few months ago I got a small brown envelope from the ARRL. Inside was the pin pictured above. That was nice but a little odd since there was nothing else found within. The mystery cleared when a letter arrived under separate cover a few days later. I imagine they plan that these would ordinarily arrive in the reverse order. 40 years! Actually it's 41 years since I became a ham as a young teenager in Winnipeg. QST and the ARRL came later when I had enough pocket change from doing summer jobs to afford a few luxuries. Life membership came several years later in what for the time was a major investment for a poor student. As I recall more folks at this end of the country tended to join CARF at that time. On the prairie many hams viewed CARF as a suspicious "eastern" organization and were more likely to look south for leadership. I'll skip all the rancour that sometimes broke out between the organizations, and their membership, some of which hit close to home. Times change. It was nice to have QST arriving like clockwork every month during my long period of inactivity, keeping me minimally in touch with ham happenings though I didn't always take the time read it. I even got my picture in QST one time. It was (I think) May 1979 when I made the CW Sweepstakes top-ten (low power) in 1978 in my final SS as a VE4. My station wasn't much, so the rare prefix had a lot to do with my achievement. Sweepstakes was never the same as a VE3. Ok, that's more than enough woolgathering. I still have a tower to put up. Once the rain finally stops.